When it comes to sleep, many people suffer from sleep apnea, which has a telltale symptom of snoring. For some people, they only experience it lightly, on and off; meanwhile for others it can become a serious problem. A simple snoring aid popular on the market is a white noise machine. White noise machines help reduce snoring as they relax the snorer as they fall asleep, leading to a deeper sleep, and the possibility of less snoring! If you’re interested in machines that combat snoring, then luckily for you we have compiled a list featuring the best white noise machine for snoring which are sure to give you a better idea of which machine to look for. 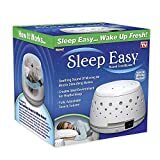 Sleep Easy is a great little white noise machine which is perfect for masking background noise and any unwanted sounds. This is a simple machine which can easily be plugged in and ready to go in seconds. Below we take a look in more detail. 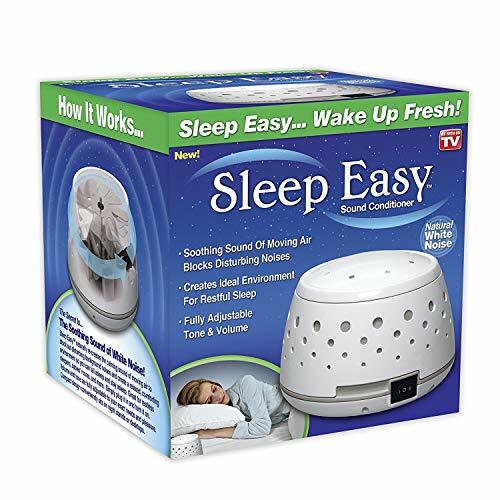 The Sleep easy white noise machine is a perfect little addition to have in your bedroom. It plays natural white noise which helps to relax and calm the mind, leading to a smoother night’s rest, which promotes deep sleep. With the Sleep Easy machine, you are in control of the sound you hear. This is because it allows you to adjust the tone exactly to your hearing needs. Is the sound too high pitched? Or not loud enough? You can sort that out in seconds, ensuring you have the smoothest and most relaxing sound possible. Featuring natural white noise sounds, the Sleep Easy machine will help mask a range of unwanted sounds, such as neighbor noise, construction, loud voices, and even your partner snoring! You can be guaranteed a better night’s sleep with Sleep Easy. The only disadvantages that come with this machine is the fact it doesn’t include a self-timer setting which many people find beneficial in a white noise machine. It has also been said to loop the sounds, which again, many people can often find quite distracting when listening for long periods of time. If you snooze you lose, but not in this case, as with Snooz’s white noise machine, you will be gaining many extra hours! This handy little fan-based device can mask a variety of disturbing noises, such as snoring, barking, street noise and much, much more! The Snooz white noise machine is another perfect little option to handle your snoring situation! This modern device is easy to use, and can be controlled remotely through its Snooz app. This means you don’t need to leave bed when a little modification to the sound is required, which is perfect to keep you comfy in bed. Snooz works effectively to reduce the delta between your ears’ baseline sounds and any contaminant noise, meaning that any unwanted or disturbing noises aren’t picked up and they will sound a lot quieter. One of the worst things when travelling is being stuck in a noisy place with no remedy but earphones to help you deal with it. At just 3.2 inches tall, this little product can easily be taken with you in your bag and used whenever you are on the road. 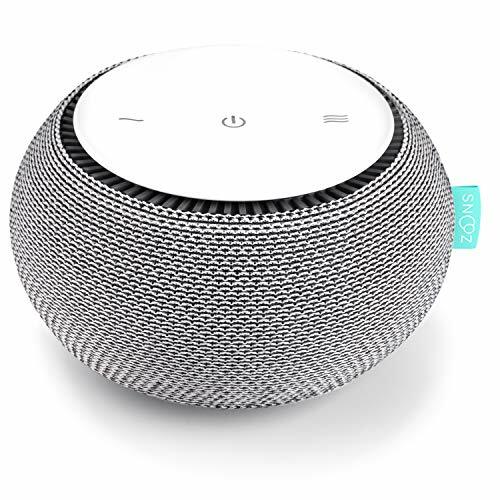 Although the Snooz white noise machine features a good variety of sound options, as well as the chance to customize them to your preferred sound level, a few customers have complained that the sounds were overall not loud enough. As well as this, the Bluetooth connection has proven to be problematic for some users. The Avantek is another white noise machine which is perfect when it comes to its power. With a rechargeable battery and memory function, it sure is a piece of technology you will not regret buying. We take a look at some of its key features below. 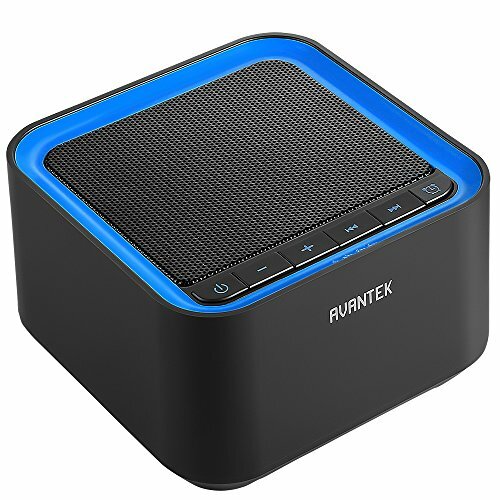 Avantek’s white noise machine is another quality sound machine, featuring on our list due to its rechargeable lithium battery offering users an impressive 10 hours runtime after a full charge! This makes it a perfect option for bed sides, as well as in public or travelling as it features a 3.5mm headphone jack, allowing you the option to relax whenever and wherever you wish. The best feature of this white noise machine is its non-looping sounds. This allows for a deeper relaxation with no interruptions between tracks, helping you to concentrate better. All of the sounds featured in the Avantek have all been recorded from live sounds! This includes sounds of nature which are guaranteed to make you feel calmer. The Avantek is only available in a standard black color. The fourth white noise machine on our list is the best sleep therapy one. This comes with five natural sounds, which are very effective for getting you into that deep sleep. It also comes with a sleep mask to make things a bit comfier. This white noise machine is a life saver for treating conditions such as sleep apnea, insomnia, sleep disorder and also tinnitus. It is perfect for covering and masking any disturbing sounds, whether it be noisy neighbors, construction workers or even barking dogs and cars. OasisSpace have created a strong machine which is capable of playing non-looping sounds for up to 12 hours when fully charged! It only takes around 2-3 hours to charge, and also comes with a USB cable and adapter. If you plan on not using it throughout the night, then the machine also includes optional 30, 60, and 90 minute automatic timers, which mean you don’t need to worry about getting up to switch it off manually after your rest. Some customers complained that this machine stopped working after a few uses and that some sounds weren’t loud enough. The Final white noise machine on our list is the HoMedics Deep Sleep Therapy machine. This device features a slim line, attractive design, and is another perfect option for your snoring needs. HoMedics are experts in innovative wellness products, and their sleep therapy machine is no exception. Their advanced white noise therapy offers four distinct sounds which will help you sleep more soundly and wake up feeling fully refreshed. 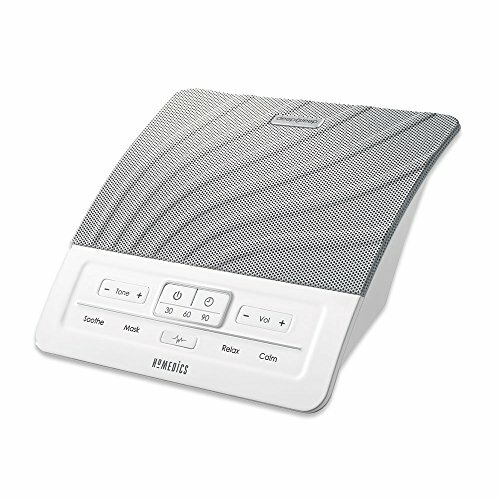 The HoMedics white noise machine features sounds including, Soothe, Mask, Relax, and Calm. Each one of these sounds is dedicated to making you feel a lot more peaceful as well as cleverly mask out any unwanted noise at the same time. HoMedics designed this machine so that it would be perfect to take anywhere with you. At a small 6.8-inch size, it can perfectly fit in your bag with ease. A few customers experienced problems with the product dying not long into ownership which is not great. As well as this, some also complained about the speakers not working too great and blowing out also after a few months of use. From our list, we believe that the best white noise machine for snoring is the Snooz white noise sound machine, for its peaceful non-looping sounds! As the sound doesn’t loop, this makes it a lot smoother on the ear, and is especially beneficial when you are listening for longer periods, for example during the night or when working or studying. This machine is also highly popular right now on the market, and is said to be a good purchase option. The second best would be the white noise machine by Avantek as it is completely eco-friendly and rechargeable with an impressive 10 hour battery life! 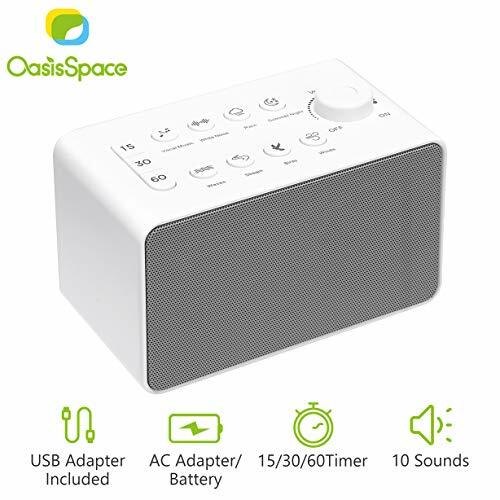 If you are shopping on a budget, however, then the OasisSpace white noise machine is the most inexpensive choice on our list. We hope that these products have given you a better idea of the selection of white noise machines out there and how exactly they are beneficial to snoring. Previous Post Best White Noise Machine for Baby Complete Reviews With Comparison Next Post What does a white noise machine sound like?